Carrie Tree is a folk singer from Brighton. This album though isn't just traditional folk - it's folk but it also uses instruments from around the world to give a different sound, most notably in the track "Mama Kita" which gets a real African feel. "Mama Kita" was recorded in the UK and also South Africa and features the guest vocals from Albert Mazibuko of Ladysmith Black Mambazo. The track uses some western instruments - Cello, Fretless bass, guitar and percussion alongside some traditional African instruments like Kora (African harp), Nyatiti, Djembe, Endingidi (traditional Ugandan tube fiddle) and also a bansari (North Indian flute). As a result it's got a very African feel to it and I think it sounds fantastic - watch the video below and hear it for yourselves. "Thousand days" is another track that stands out thanks to the involvement of African singers. It's got more of a folk feel to the song than "Mama Kita" but the African elements do help give it a unique sound. There's a lot of subtlety in the album - for example, "Sweet oak tree" includes strings and woodwind instruments but the vast majority is just acoustic guitar and Carrie's lovely vocals and some very soft drumming with the other instruments used for only a small amount of time and even then kept soft in the background. They still add to the song but without taking the attention away from the guitar and vocals. This is a fantastic album. 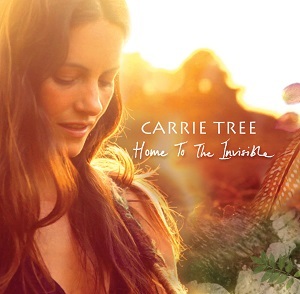 Carrie Tree has a great voice and has written an album packed with excellent songs with each standing out as an individual from the others. For me though the standout track has to be "Mama Kita". Well worth checking out - strongly recommended. "Home to the invisible" will be released on 17th March 2014 on Wild Cedar records.